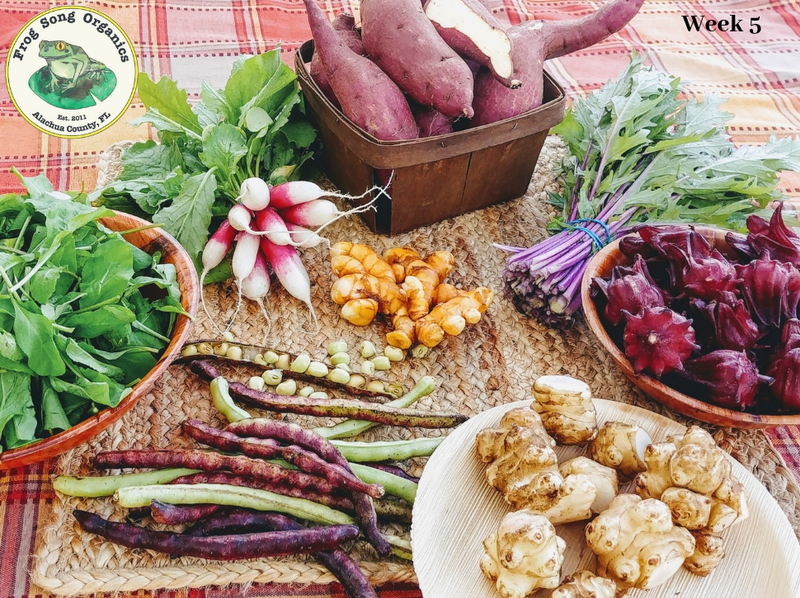 This Weeks Share Includes: Purple Hull Peas, French Breakfast Radishes, Purple-Stemmed Mizuna, Roselle Hibiscus, Murasaki Sweet Potatoes, Turmeric, Baby Arugula and Sunchoke. Roselle: Do you have an abundance of roselle seed pods taking up your refrigerator space? Try freezing or drying them. 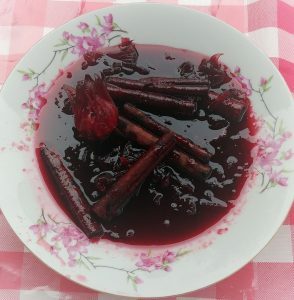 If you have time but not a lot of freezer space, peel the calyces (red petals) off of the seedpod and store them in a ziplock baggie in the freezer. Do you have a lot of space but not a lot of time? Simply freeze the whole calyces seedpod included, this is a simple way to store it if you plan on making Hibiscus Tea with it however, it will be difficult to remove the seed pod after thawing so if you plan to make a recipe using just the calyces alone I would suggest removing the seed pod before storage. 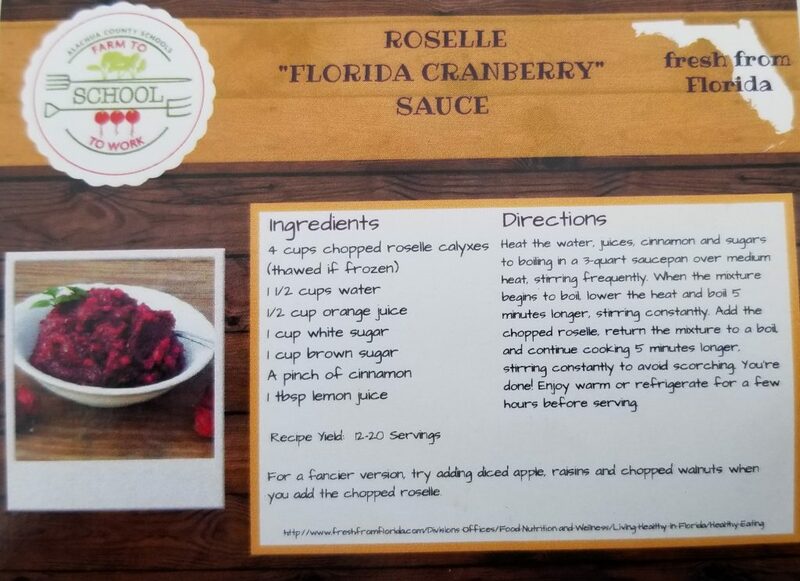 Now is the perfect time to make some roselle “Florida Cranberry” sauce to pair with your Thanksgiving day turkey, follow this easy recipe to make a delicious alternative to a traditional Thanksgiving side. Murasaki Sweet Potato: First of the season. These crimson skinned sweet potatoes have a starchy white flesh rather than a bright orange flesh and have 60% more sugar than your average american sweet potato but they cook up just the same. Peel them or leave the skin on for the nutritional benefits and cook as you would a sweet potato. Try making a sweet potato pie for Thanksgiving combining all varieties of sweet potatoes from your past shares. Purple Mussissippi Hull: After an hour of shelling peas I am nowhere near an expert in the skill, my fingers hurt and I basically have enough for about 2 spoonfuls. What is the secret? Fingernails!… Having fingernails is the secret. If they are green and fleshy more like a large green bean they are a bit young and may be a little harder to open. To open try slide your thumb or thumb nail down the middle seam the pod will open. Cook the peas as you would any other peas if you want to freeze them for later, to freeze blanch in boiling water to cover for 2 minutes; cool immediately in ice water, and drain well. Package in zip-top plastic freezer bags. Good for about 6 months. Baby Arugula: These delicate and tender leaves are spicy and delicious. Mix them in with your salad greens to add a little zest, or toss them on top of tacos and in burritos for a tasty alternative to lettuce with a little kick! French Breakfast Radish: This petite and dainty radish variety is exactly what you would expect given its name. Snack on them raw, slice and toss them in your green salad or try them my favorite way: sliced thin on some buttered toast with a pinch of sea salt. The greens are edible and tender but have a slight hairy or prickly texture that may not be so well recepted by some. Turmeric: Curcumin is the key chemical in turmeric that gives it the golden color and claims to reduce pain, inflammation and stiffness related to rheumatoid arthritis and osteoarthritis. Known as a cleansing agent, Turmeric often is used as a digestive aid. 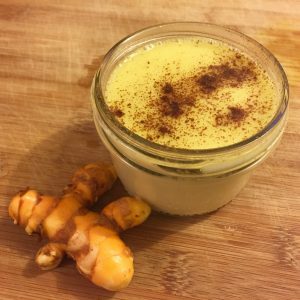 Try the Ancient Golden Milk recipe to soothe your stomach and calm you before bed. Hint: Use the ratio 3 to 1 when substituting raw Turmeric for powdered Turmeric. Purple Stemmed Mizuna- A Japanese mustard green. This variety produces beautiful purple stems and fresh green leaves, which are very attractive when mixed with other salad greens. The young leaves and stems have a crispy texture, ideal for baby leaf salad mixes. This asian green has quickly become one of the most popular vegetables offered by the high-end gourmet restaurants in Japan. Eat it raw or sautee it with other leafy greens.